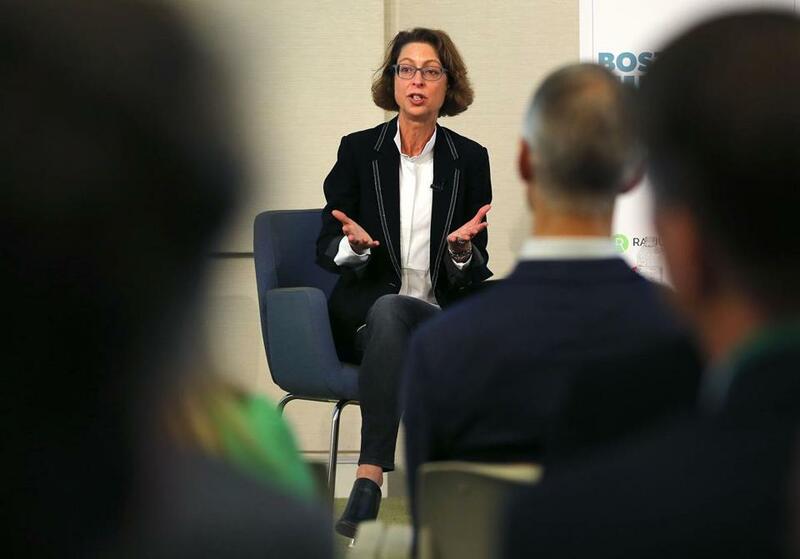 Abby Johnson, Fidelity Investments CEO, spoke Friday at a presentation during Boston Fintech week. Fidelity Investments remains one of the largest fund managers in the world. But CEO Abby Johnson believes it is imperative for many of the Boston company’s employees to think and act like they work for a startup, in an effort to stay ahead of industry trends as financial technology evolves. That was the general theme of Johnson’s presentation on the final day of Boston Fintech Week, an industry-sponsored series of events looking at the next generation of startups and technology for the sector. Johnson spoke during a question-and-answer session on Friday with Sarah Biller, co-founder of the FinTech Sandbox, a local nonprofit, at Fidelity’s headquarters overlooking the Fort Point Channel. Johnson highlighted the work of two arms of Fidelity Investments, the Fidelity Center for Applied Technology, or FCAT, and Fidelity Labs, its in-house incubator for fintech ideas. She noted that the company also invests in financial startups through its venture arm, F-Prime Capital. Johnson said that when her father, Ned Johnson, launched FCAT in 1999, the goal was to help clients and employees explore emerging technologies that could help spur Fidelity’s growth. Among FCAT’s more recent initiatives: a virtual reality experiment known as “Cora” — created in partnership with Amazon Web Services — that could provide assistance to investors. “Back in the ’90s, my father was CEO, and he strongly felt there should be a cadre of people in the organization who were charged with researching the cutting edge of technology,” Johnson said. The company in 2005 started Fidelity Labs to develop new products and services. Among the more recent successes: bSolo, which assists self-employed people with their finances, and an employer contribution program that helps employees pay off student debt. “We didn’t get to where we are today without pushing ourselves and asking ourselves. . . what in the financial services arena can we reimagine? What can we do differently?” Johnson said.